He was the youngest recipient of Nobel Prize in Literature, the first writer of English language to have that honour conferred on him. My inspiration in writing, Ruskin Bond, found inspiration in his writing. 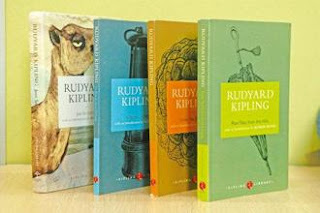 And if I had one regret emanating from the world of literature (which I know is vast and perhaps has no place for regrets), it was that I never got an opportunity to read any work of the great storyteller Rudyard Kipling. However, in a recent set of book Rupa Publications sent me for review, I got my chance to overcome that regret. 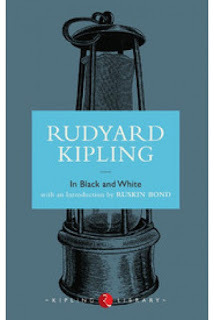 It is a small book, priced humbly, to invite readers to the enamouring, but critical world of Kipling. My favorite among all is a story called "Dray Wara Yow Dee". Don't ask me what that means. I just know I enjoyed this tale of a lover betrayed, seething with revenge. For the first time, it was not poetry, but prose in which I found an unmistakable lyrical quality. Kipling has a controversial place in History. He is credited with a doctrine which not just justifies, but glorifies imperial conquests. Given his philosophy of 'A White Man's Burden', I have always wondered how is it that Kipling wrote of nothing but India and its people, so much so, that many literary connoisseurs bracket him in the Indian Writing in English category. A man, not wedded to the sensibilities of this magnificent land could not have possibly written literature which seems like our own. Perhaps this dichotomy in Kipling's writing is best understood in the words of one of my English teachers, who warns with affection - History often doesn't give us the chance to alter our opinions, we must learn to be careful with them. Its a 3.5 on 5 star book for me. I love Kipling. No wait, I like. Love is too strong. Although I've enjoyed 1-2 books of his, I couldn't for the life of me finish a couple of others. "Kim" was one such book. Although its a classic, I couldn't even finish it. I have Kim on my wishlist. I do hope I am able to survive through it. Really want to.